The foremost alternative that is to be considered is paint.net that provides basic features required for image editing. You easily can choose the paint.net as your choice as it is the alternative that has all the basic features of the image editing and also it is very simple to use. If you are aware of the windows paint then remember this is the much more similar to it. It also allows the users to install the various plug-in to actively enhance its features in terms of editing. The tool is less compelling and dominant than the Gimp, but overall it can be the right choice for the needs of the consumers. 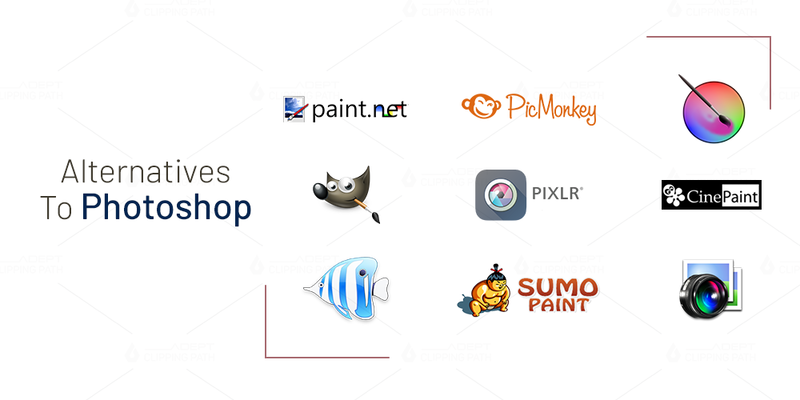 Gimp stands at a good place in the list of various alternatives of Photoshop that is available free of cost and is the one that offers you the features of the editing using which editing the images by giving professional touch is possible. The excellent feature that is provided by the Gimp is like color correction, re-touching, selection editing, sharpening, plug-in support and many more. Another alternative of the Photoshop that makes possible the image editing is seashore that is an open-source image editing software. The acceptable fact is that it is not as powerful as the GIMP and Photoshop but offers the wide range of the services of editing to the user. The powerful features offered by the user include gradients, multiple layers, brush strokes and many other related features. This is the software provides very easy access to the editing and also offers easy-on eye interface and that is the admirable feature of this editing software. This is the software that offers the user editing of the images by using the browser for image editing. The name of the Pixlr is important for the reason that helps in the editing of the images from the browser. It is the most used and best ever image editing tool that is originally web-based. This is the elementary and the finest web image editor that provides the best features like layouts, keyboard and by using the other short-cuts for the image editing. One of the free online software that helps in accomplishing many of the advanced features in one goes. But remember if you exaggerate the thing with regard to the editing, the images will become unattractive and seems ugly to the viewer so carefully perform the editing task using the special features of the editing. The other amazing feature of the Pixlr is that it bases the various other file formats like Gif, Tiff, Bmp, Jpeg etc. which provides convenience to the user. The next name that we will listen in the category of the editing apps is the Picmonkey that makes the editing of the images possible by providing number of features that also includes various Instagram features like wrinkle removal or blemish removal which overexcites the quality of the images but reminded that it also can also impose worse impact on the images if it is overdone by the editor. This is the other web-based editing software available in both free and paid version ready to fulfill the editing needs of the users by providing the awesome features like brushes, gradients, symmetry tools and other fun editing tools. The software is good for creating funny images like party hats and also by using the funny masks too. This is the lightweight, feature full software available online and is free of cost to make the images of the users to look best from all aspect by providing editing services at a supported web-based platform. Other praiseworthy software that provides various kinds of image editing tools is Krita that is based on an open source platform like UNIX and Linux. This can also be the great choice for the users who want to achieve the editing needs of the images through open source based software available at no cost. This is true that this software does not have the awesome features like Photoshop and GIMP but it is a good and powerful alternative to the image editor that also supports any window based file formats conveniently. This is one of the images editing software that has linked its name with the major Hollywood studios for the purpose of designing various kinds of animated films. This is really powerful retouching tools providing versatility to the user to not only edit or retouch the images but the different type of videos too. It supports all the UNIX based systems offering convenience to the user. The software is equipped with outstanding features like frame manager, retouching, 32-bit image editing and many more. This is one of the cost-effective software that comes from Corel. It provides a slick user interface and also administers the variety of brushes and tools elementary in image editing. That’s all about the best alternatives that are available in the market as against photo-shop but remember photo-shop will always be the ideal software for the professionals.